(Nanowerk News) An accumulation of a protein called amyloid-beta into large insoluble deposits called plaques is known to cause Alzheimer's disease. One aspect of this illness that has not received much attention is which role the structure of the brain environment plays. How do macromolecules and macromolecular assemblies, such as polysaccharides, influence cell interaction in the brain? In a paper published in the journal Proceedings of the National Academy of Sciences ("Stochastic nanoroughness modulates neuron–astrocyte interactions and function via mechanosensing cation channels"), Prof. Prasad Shastri and graduate student Nils Blumenthal, in collaboration with Prof. Bernd Heimrich and Prof. Ola Hermanson, have discovered that macromolecules or support cells like astrocytes provide well-defined physical cues in the form of random roughness or ruffles that have a crucial role in promoting and maintaining healthy interactions between cells in the hippocampus. This brain area is regarded as the brain's GPS system: It processes and stores spatial information. In Alzheimer's disease, this area degenerates. Shastri says, "It has been long thought that only biological signals have a role in health and function of brain cells, but here we show that the structure of the molecules that surround these cells may be equally important." 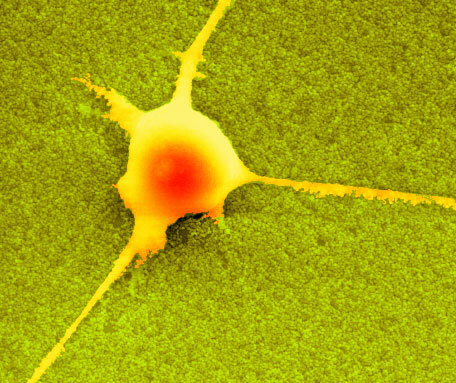 The researchers found that there is a restricted regime of roughness at the nanoscale that is beneficial to neurons. If the magnitude of roughness exceeds or is below this regime, neurons experience detrimental changes to their function. By analyzing human brain tissue from patients who suffered from Alzheimer's disease, Shastri's team has found a crucial link between regions in the brain that have amyloid-beta plaque accumulation - which are responsible for neuron death - and unfavorable changes to the nanotopography in the tissue surrounding these neurons, that is the features of its surface..
Shastri and his co-workers have found that astrocytes provide a nanoscale physical environment that neurons need to function well. "Our discovery shows for the first time that stretch-activated ion channels may have a role in central nervous system function and disease. Hence, our findings offer new pharmacological targets", says Blumenthal. Using synthetic substrates of precise roughness, they found out that stretch-sensitive molecules, including the so-called Piezo-1 ion channel in murine brain cells, direct the interaction between nanotopography, astrocytes and neurons. Former research has shown that the expression of MIB-1, a human analog of Piezo-1, is altered in human Alzheimer's patients. Prof. Prasad Shastri conducts his research at the Institute for Macromolecular Chemistry and the Excellence Cluster BIOSS Centre for Biological Signalling Studies of the University of Freiburg. Graduate student Nils Blumenthal is funded by BIOSS. Prof. Bernd Heimrich is at the Institute of Anatomy and Cell Biology of the University of Freiburg and Prof. Ola Hermanson is from the Karolinska Institute in Stockholm/Sweden.